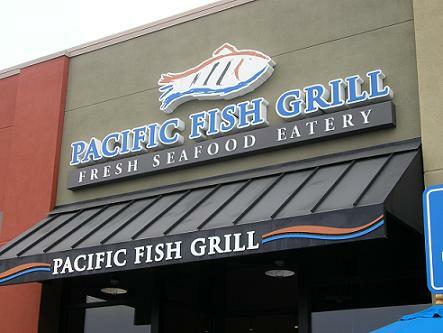 Pacific Fish Grill is at the Shoppes at Chino Hills and, from what I can gather, is a single-location restaurant, although it could be a chain in the making. It’s located between a Panera and a Johnny Rockets near Barnes & Noble. Like Louie’s Chicken and Fish Grill in Upland, featured here last week, Pacific Fish is a rarity, a seafood-based fast-casual restaurant. Grilled fish plates run $8 to $15 and come with rice, salad and pita bread. They also have salads, fried fish, sandwiches, wraps and tacos. View the menu here. I ate here in February after the library dedication when I bumped into friends and we decided to have lunch. That meal I ordered the tilapia plate ($8.95) with lemon-oregano seasoning. Not bad. I returned recently (this time with my camera) and ordered a salmon caesar salad with Cajun seasoning ($10.95). I liked it. Not an outstanding piece of fish or anything, but it was fine, and there was enough salmon for each bite of salad. There’s an open kitchen, high ceilings with visible piping and slowly revolving ceiling fans. A place like this (or Louie’s) seems like a fairly inexpensive, no-fuss way to get more seafood in your diet. People on Yelp say the fish tacos are good; on Tuesdays they’re 99 cents. This entry was posted in Restaurants: Chino Hills and tagged Chino Hills, restaurants, seafood, Shoppes by David Allen. Bookmark the permalink. For dessert, there is a nice place around the corner called Dolcissimo that specializes in cupcakes. Pretty good! I discovered the Pacific Fish Grill not long after they opened, and have been back many times since. I like, as you said, to be able to get good fish in a casual atmosphere — I’m very comfortable eating there alone. And I like the mix and match menu — picking this fish with that seasoning over a salad or on a plate. I tried the calimari once, and liked it, especially the generous portion! (But all their portions are generous.) I think my favorite thing so far is the tuna. They are certainly polished and professional enough to be a chain, but one of the workers told me they are not. I agree with you, though, that they could be soon!